Joe Biden, Congratulator In Chief : It's All Politics Politicians often call members of their own party to congratulate them on a successful campaign. But Biden seems to relish the opportunity, personally reaching out to 10 winning candidates in state and local races around the country Tuesday night. The vice president, who was on the presidential campaign trail last year in Florida, spent Tuesday calling winning candidates across the country. Vice President Joe Biden's name didn't appear on any ballots Tuesday, but he still had a busy election night. Prominent politicians often call members of their own party to congratulate them on a successful campaign. But it appears Biden is an especially diligent practitioner, making 10 phone calls to winning candidates in state and local races across the country Tuesday, according to USA Today. The call that got the most attention was the one the vice president made to John Lundell, the winner of the Coralville, Iowa, mayoral election. In political terms, the congratulatory call was a twofer. 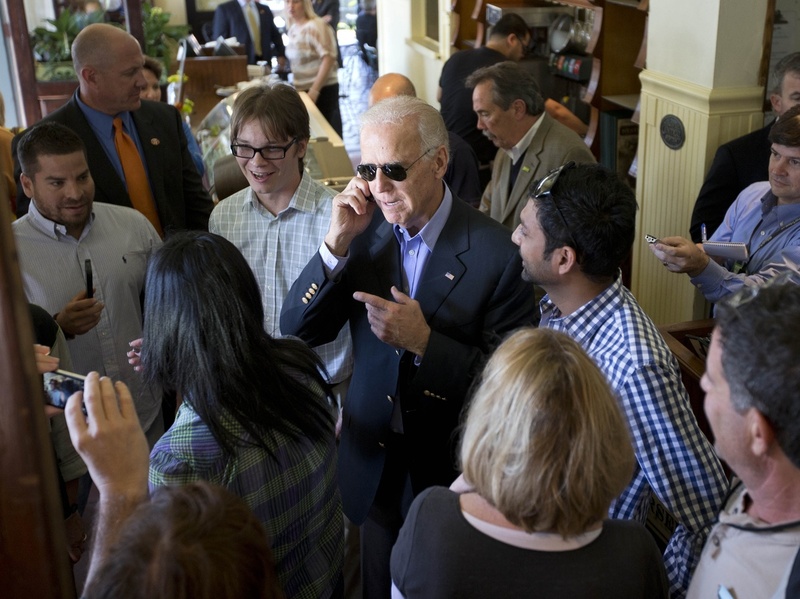 Iowa, of course, holds the first caucuses of the presidential election cycle, and Biden is a prospective 2016 candidate. But Lundell's win also represented a setback for Americans for Prosperity, a national conservative organization funded in part by the billionaire industrialists Charles and David Koch, which made an effort to defeat Lundell and three City Council members. "He indicated that he was very proud of our city, that we took on the Koch brothers and successfully beat them by such a huge margin," Lundell said of Biden. "That was another aspect of this election that was unanticipated, that after the polls closed that I'd be speaking to the vice president of the United States." Biden also made sure to remember his roots Tuesday. An alumnus of Syracuse University's law school, Biden reached out to Syracuse Mayor Stephanie Miner just minutes after the polls closed. According to Miner, who also serves as co-chair of the New York State Democratic Committee, Biden said that he couldn't actually find the results online, but that he knew she would win re-election. "He said, 'I'm very proud of you. You're doing great work there. I love you. Congratulations,' " Miner said. "He called me 'kiddo.' "
Biden also personally congratulated Ed Pawlowski, the mayor of Allentown, Pa., which is about 75 miles south of Biden's birthplace of Scranton. The vice president's night wasn't without its hiccups, however. Biden tried to place a call to Boston Mayor-elect Marty Walsh, but instead he got the wrong Marty Walsh. "You son of a gun, Marty! You did it!" he told the Marty Walsh who is not going to be Boston's mayor, but was a staffer for the late Sen. Ted Kennedy. Democratic National Committee chair Debbie Wasserman Schultz and Minneapolis Mayor R.T. Rybak made the same mistake. In addition, Biden phoned former Democratic National Committee chair Terry McAuliffe, who he stumped for the day before the election, to congratulate him on his win in the Virginia governor's race. The list of other victors who received Biden calls Tuesday included Chapel Hill, N.C., Mayor Mark Kleinschmidt and Hoboken, N.J., Mayor Dawn Zimmer. As for President Obama, he made congratulatory calls to McAuliffe, Walsh and New York City Mayor-elect Bill de Blasio on Tuesday night, and Republican Gov. Chris Christie on Wednesday.